Doris E. (McPherson) Allen – of Woburn, March 17th, at eighty one years of age. Beloved wife of Carl Allen. Loving mother of William G. Allen and his wife Nora of Woburn. Cherished “Nana” of Ryan and Patrick Allen. 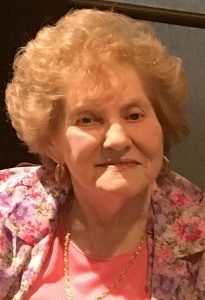 Relatives and friends are respectfully invited to her Funeral Mass, which will be celebrated in St. Charles Church, 280 Main Street, Woburn on Friday, March 22nd at 11:30 a.m.. There are no calling hours or burial. Arrangements are under the direction of the Lynch-Cantillon Funeral Home, 263 Main Street, Woburn. Doris E. (McPherson) Allen – of Woburn, died peacefully, March 17th, Winchester Hospital, at eighty-one years of age. She was the beloved wife of 62 years to Carl Allen. Born and raised in Somerville, Doris was a daughter of the late Bancroft and Doris (Shea) McPherson. During High School, Doris attended a Army Baseball game with friends, and it was there she met her future husband, Carl. They made their home in Somerville, raised their son until moving to Woburn, where they retired. For many years, Doris worked as a secretary, first for a car dealership and later for an Insurance Company. Doris had a hunger for knowledge and was an avid reader. She enjoyed summers in Cape Elizabeth, Maine and Cape Cod with her family. Although due to illness, the last few years had been difficult for Doris, she was still a generous, thoughtful and loving women who enjoyed spoiling her grandchildren. Along with her husband Carl, Doris is survived and will be deeply missed by her son, William G. Allen and his wife Nora of Woburn. Cherished “Nana” of Ryan and Patrick Allen. Relatives and friends are respectfully invited to her Funeral Mass, which will be celebrated in St. Charles Church, 280 Main Street, Woburn on Friday, March 22nd at 11:30 a.m.. There are no calling hours or burial. Arrangements are under the direction of the Lynch-Cantillon Funeral Home, 263 Main Street, Woburn. Interment will be held at later date. Relatives and friends are respectfully invited to her Funeral Mass, which will be celebrated in St. Charles Church, 280 Main Street, Woburn on Friday, March 22nd at 11:30 a.m.. There are no calling hours. Arrangements are under the direction of the Lynch-Cantillon Funeral Home, 263 Main Street, Woburn.Service arrangements pending, please check back soon.